Known locally as “The Caley”, the Caledonian Brewery is a distinctive red brick building from the Victorian era. It is famed for using traditional brewing methods and equipment such as traditional open square fermenters and original direct fired heated copper kettles. However, Caledonian is also a progressive brewery with a state-of-the-art pilot brewery and modern conical fermenters, allowing it to brew progressive new world styles and lagers. The Caledonian Brewery lies in the Shandon area of Edinburgh, some three miles west of the city centre. The brewery has always occupied the same triangular site, its expansion limited by its being bounded by Slateford Road on the southeast side, a graveyard to the northeast and the Caledonian railway line completing the triangle on the northwest boundary. In the 1860s, when the brewery was established, the railway line, then the Caledonian Railway, was the mainline from Edinburgh to the south of England. At that time there wasn’t an east coast mainline. 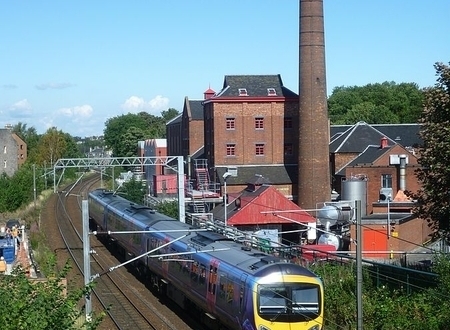 The proximity of the railway allowed easy access to raw materials such as malt and hops, but also allowed easy transportation of the finished beer. When it completed in 1869, Lorimer and Clark’s Caledonian Brewery was the 42nd brewery to open in Edinburgh and the city was then a major centre for brewing due to the quality of its water. Edinburgh sits atop a volcanic plate with Arthur's Seat and the Castle Rock, on which Edinburgh Castle is built, part of a rock formation called the Salisbury Crags formed by an extinct volcano. A layer of red sandstone covers the impermeable volcanic rock beneath Edinburgh and the trapped water in this layer is high in calcium and sulphate but low in sodium and chloride, making it ideal for brewing. Such is the renown of this water that the series of deep wells sunk by brewers of the period became known as the Charmed Circle. While the water of Burton-on-Trent was brilliant for making brown beers and London’s harder water suited to stouts and porters, Edinburgh’s water was perfect for brewing crisp pale ales. The quality of the water and the reputation of Edinburgh’s beer led to the construction of many new breweries. Most towns and cities had a number of breweries but at its height Edinburgh boasted 42. 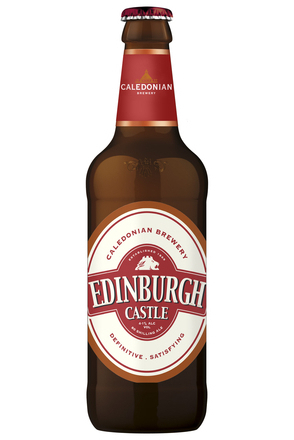 Today, the Caledonian Brewery is the last of those 42 breweries still in existence in Edinburgh. Caledonian’s survival is a testament to the quality of its beer, the listing of is Victorian red brick buildings as being of historical significance so saving them from potential demolition in the 1980s, and the foresight of Heineken, who saved the brewery from bankruptcy during the recession of 2008 and continue to invest in the brewery as one of their flagship breweries to this day.